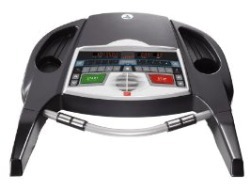 For all of the features that are included on the Merit 735T treadmill, it doesn't look to be a tough competitor against other machines selling for less than $600. The Merit 735T treadmill has a 4-window LED with dot matrix display that shows readouts for speed, time, distance, and resistance level. The Quick Speed and Incline keys let you makes changes without scrolling through levels. UPDATE: As of 2016 the Merit 735T is no longer available. You can check out the other models on sale now here. While it offers a top speed of 10 mph, we would caution potential buyers that the Merit 735T treadmill is mainly a walker’s machine. It can handle light jogging, just don’t go overboard with this smaller motor which rates as 1.75 CHP (2.75 THP). The 18" x 52" belt has a speed ranging from 0.5 to 10 mph in 0.1 mph increments, and this model also comes with a motorized incline control and a fold up frame design. As for cons, the Merit 735T has a weak fan and while there are pulse monitor handgrips on the handlebars, they don’t work well. That’s no shame, however; no other brand has found a decent HR monitor to install on any treadmill under $1000 either. You should buy yourself a good handheld heart rate monitor for about $40 if you want to check your pulse during workouts. Lastly, the 90 days parts warranty is bad news. A 150-lb treadmill is the last product in the world you want to bring home without a decent warranty to cover any mechanical issues. The Merit 735T is a fairly good deal for $549, although you may want to buy a 3rd party extended warranty, and that is going to drive up the final price you’ll pay. 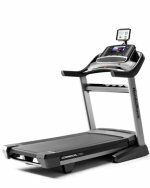 You will want to compare this model to the Horizon T101 treadmill at $599 that has better specs with its 2.25 CHP motor, better warranty, and more features. 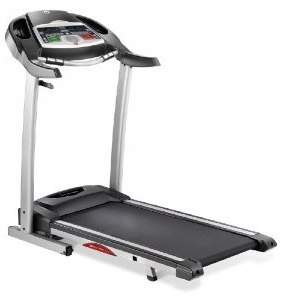 Also, there’s the $549 LifeSpan TR100 compact treadmill that weighs 119 lbs, has a smaller belt, a walker’s motor (1.5 CHP), a good warranty, and folds to just 11 inches thin. If you need space and portability, go with the LifeSpan, otherwise, the Merit 735T treadmill is a runner-up to the Horizon.